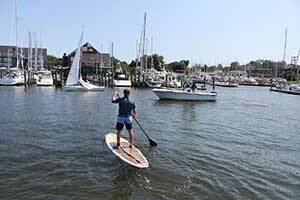 SUP enthusiasts must operate with “defensive” paddling, proper gear, and know your limits. Since collisions are the number one type of accident on the water, boaters should remember these basic navigation rules. For basic awareness training on many of the “Rules of the Road” take a boating safety course. The Marine Board has three approved internet courses, in addition to classroom or equivalency exam options that cover all of the navigation rules, waterway markers, sound signals and scenarios with other water recreationists. Please note, navigation rules generally do not use the term “right of way.” Instead vessels are directed to “stay out of each others way.” A vessel required to stay out of the way of another vessel is called the “give-way” vessel and the one that should maintain its course and speed is referred to as the “stand-on” vessel. Post a lookout. Designate someone to watch for dangers that may come from any direction. 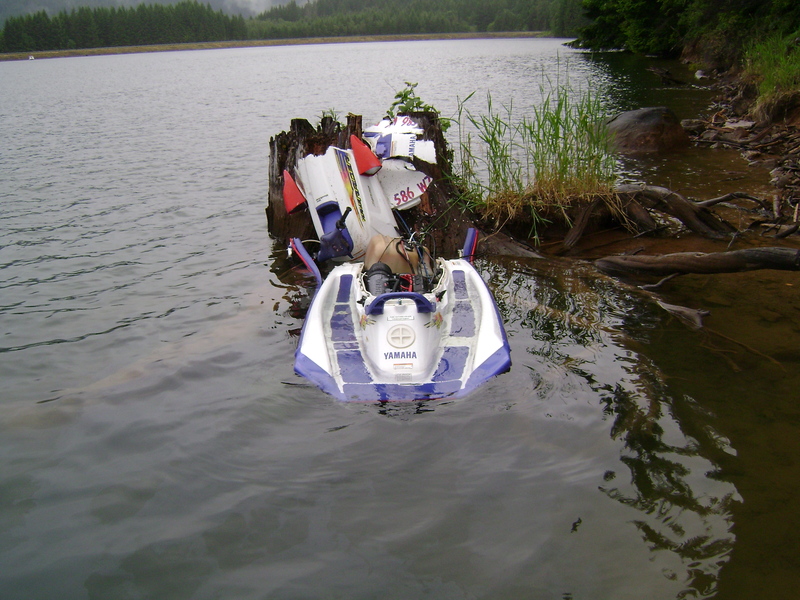 Image of a personal watercraft after colliding with a tree stump while operating too fast near shore. Avoid a collision. 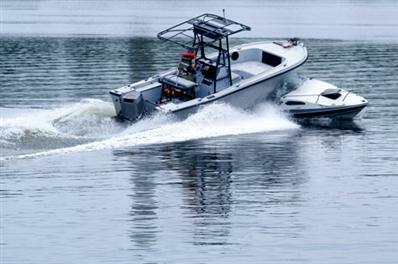 The Rules of the Road include the actions to take when encountering another vessel on the water. Some of the most common situations you may encounter are: 1) overtaking, 2) meeting head on, and 3) crossing the bow of another boat. In each case, the boat designated as the “give-way” vessel is required to yield to the other boat, while the boat designated as the “stand-on” vessel should maintain its course and speed. When meeting another boat, a boat operator is not required to “make early and substantial changes to their course” unless there is a risk of collision (reciprocal or nearly reciprocal) – they may be able to just stay on course. If there is a risk of collision, then the boat operator must change the course and/or speed of the boat. Overtaking: The give-way vessel can pass on either side of the stand-on vessel, but must remain well clear of that vessel. Meeting head on: When meeting another vessel head on, a port-to-port passing is preferred. Passing starboard-to-starboard is acceptable when necessary. Crossing situation: In a crossing situation, the give-way vessel must act to avoid a collision. This may include altering its course to pass astern of the stand-on vessel or slowing down or both. The stand-on vessel should maintain its course and speed. Remember -as a boat operator, always take early and substantial action to avoid a collision and always drive defensively. ← What’s Happening with Hendrick’s Bridge Boat Ramp?